Recently, I wrote a review for Mary Kay's Give Joy, Give Dreams and Give Hope promotion that is taking place now until December 15th. The way this promotion works is for every limited edition lipstick that is purchased (three colors) for $13, Mary Kay will donate $1 to end domestic violence. 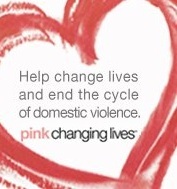 If you haven't checked it out yet, visit Mary Kay and consider contributing to this great cause! Now, starting today in conjunction with the above-mentioned promotion, Mary Kay is going to be showing a series of three short films in the effort to band together and continue to combat domestic violence. October is Domestic Violence Awareness Month and this is why Mary Kay is putting so much effort into this important cause. All I ask that you do is watch the film below. It is approximately 12 minutes long so it will take you very little time to watch. These three films (which I will be promoting over the next few weeks) will feature the celebrities Maria Menounos ("Extra"), JoAnna Garcia Swisher ("Better With You") and Alexa Vega ("Spy Kids"). Today's film is entitled "Give Dreams" and it is narrated by Maria Menounos. Enjoy! Also, I ask that you join the Mary Kay Facebook page. For each new Facebook fan in October, Mary Kay will again donate $1 to the Mary Kay Foundation...up to $1 million. WOW! So, if you cannot purchase a lipstick, at least follow them on Facebook!!! Now, on to the giveaway! 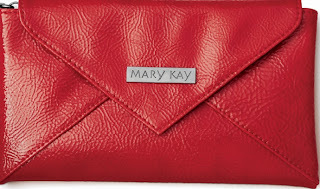 This one is going to be pretty simple...only several entries are required and the prize will be this super cute clutch. Inside of this Mary Kay Clutch you will find a Mary Kay Lash Love Mini, a Bella Belara Fragrance Wand and a Beauty That Counts Sampler Card. This clutch has a retail value of $25. Here are your entry options! Watch the video above, then leave a comment telling me something that you learned. :) You do not have to be a blogger to enter, but you must have a valid email where you can be reached should you win. If you do not leave an email address, it must be where I can easily find it. This giveaway is open to US residents and will end 10/27 at 11:59 pm EST. The winner will be chosen using random.org and will be notified by email. The winner will have 48 hours to respond, or another winner will be selected. I learned you don't have to live with violence, there is help by talking to someone. I didn't know domestic violenece was the number one cause of injries to women. I learned that domestic violence is the number one cause of injury to women in the United States...that is heartbreaking! THis makes me mad, domestic violence is so tragic. We should have this month be another month, because of the breast cancer. LEts have a color for domesctic violence and put as much effort in that. I learned not to let someone else live in an abusive relationship! I like Mary Kay on Facebook as Erin A.-L. I didn't know Mary kay had this inspiring stories program. It is great to see people working to stop domestic violence. I think this video was very inspiring. I know I lost my dream because of a guy I dated. This video will be a great teaching tool, thank you for sharing! 1 ~ Like Mary Kay on Facebook! 2 ~ Like Mary Kay on Facebook! 3 ~ Like Mary Kay on Facebook! I learned that Mary Kay will donate $1 from each lipstick sold from September 15 to Dec 15 to the Mary Kay Foundation. I am sad to say that it is the case that the emotional--psychological--abuse cuts deeper in some ways. It is a brave thing to get out of that and remember the dreams. Domestic Violence is the #1 cause of injury to woman in the United States. So sobering. I learned that domestic violence is the number one cause of injury for women in the U.S. The dream is having the power to overcome the abuse of domestic violence. It's hard but talking to one person is the first step. I learned domestic violence is physical AND emotional. If you're a victim of it, talk to someone. I learned that the #1 cause of injuries toward women is domestic violence.